The average golfer typically plays approximately 37 rounds of golf per year. One study has shown that during a two year period, 60% of golf professionals and 40% of amateurs suffered either a traumatic, or overuse injury while playing golf. Over 80 percent of the reported injuries were related to overuse. Low back pain is the most common complaint among both professional and amateur golfers, followed by injuries to the upper extremities (elbow and shoulder). 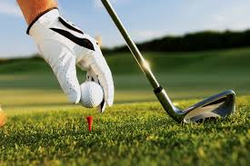 Professional golfers experience a higher number of wrist injuries, and amateur golfers experience more elbow problems. Both groups have a relatively high rate of shoulder injuries. Low back problems can occur as a result of the powerful rotation and extension motion in the golf swing. In elite golfers the golf swing can generate club head speeds of over 190km/h. Increasing the range of motion of lumbar spine extension and rotation of the lead hip (left hip in right-handed golfers) may decrease the incidence of low back pain. Golfers who carry their own bag have twice the incidence of back, shoulder and ankle injuries as compared with those who do not carry their bag. The elbow is the second most commonly injured area in golfers, and the most common area to suffer from chronic injury. The two most common problems are medial epicondylitis (also known as golfer’s or thrower’s elbow) and lateral epicondylitis (more commonly known as tennis elbow). Both are thought to occur as a result of poor swing mechanics. Medial epicondylitis is thought to be caused by hitting shots “fat” (that is, hitting the ground first), and lateral epicondylitis may be caused by over-swinging with the right hand in right-handed golfers. Both of these problems increase with age and frequency of play. The shoulder is another commonly injured area in golf. Muscles in the shoulder that are most active during the swing are the subscapularis (a rotator cuff muscle), pectoralis major, and latissimus dorsi. Glenohumeral impingement syndrome (bursitis / rotator cuff tendinopathy in the shoulder) and arthritis are the most common shoulder problems seen in golf. These occur most frequently in the lead arm. Injury Prevention: Good pre-round stretching of the upper extremity and a good strengthening program have been shown to decrease both elbow and shoulder injuries. Those golfers who adequately warm up have less than half the incidence of injuries than those who do not warm up before playing. Good swing biomechanics leads to a lessened injury rate: seek lessens from a golf-pro. Taking as little as 10 degrees off your back swing reduces the incidence of low back pain significantly. A regular exercise program that includes core strengthening, stretching and strengthening of all the major muscle groups used in golf can help decrease your injury rate.